Unwanted mice can create a serious nuisance. Not only do they make holes, leave droppings and gnaw at your wiring, they can carry viruses dangerous to humans. The presence of these critters can prove especially dangerous for people with asthma or allergies. If mice have invaded your home, consider driving them away humanely without the use of traps, poisons or pesticides. Using just Tabasco sauce and ammonia, you can repel these rodents and create a pest-free environment. The scent of ammonia can drive mice away. Locate the areas where mice congregate. 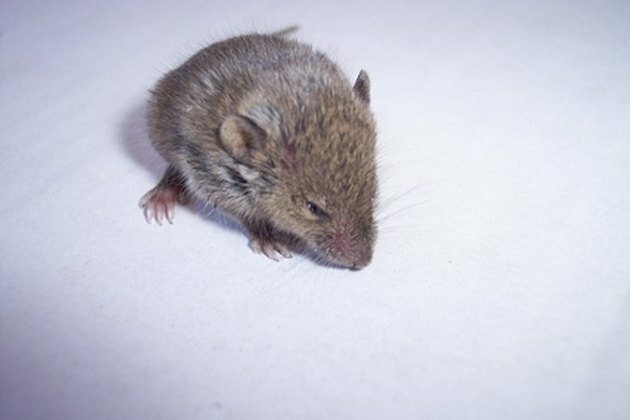 Check the attic, basement, garage, rafters and anywhere else where you may have noticed signs of a rodent's presence, like droppings or mouse holes. Fill some bottle caps or small bowls (like those used for dips) with ammonia and place them beside the openings where mice enter your home. These would include mouse holes, cracks and any narrow passages in the specific areas where mice commonly invade. Pour some Tabasco sauce into a spray bottle. The Daily Puppy recommends using two teaspoons of Tabasco mixed with a quarter cup of liquid dish soap. The soap will create an adhesive, allowing the Tabasco to stick for much longer when sprayed. Spray your Tabasco sauce or Tabasco-soap mixture around your attic, basement or other mouse-infested areas. The scent will drive mice away and the ammonia will prevent new mice from entering. Monitor the areas where you have placed the ammonia and Tabasco sauce. If you continue to notice mice or mice droppings, spray again and increase the amount of ammonia in the bowls.